Dreambuilder Custom Homes is pleased to announce the completion of Dreambuilder Nine: a master bath remodel transformation for the Hughes family in Jacksonville, FL. The original bath was full of low-grade finishes such as vinyl floors, oak cabinets and laminate countertops. Additionally, the configuration of the water closet, linen closet and shower entrance was awkward for the homeowners. Additionally, the Hughes wanted to update their bathroom with contemporary finishes to create a serene, spa-like environment. And the results are indeed impressive. Removing the linen closet and redesigning the water closet enabled the shower to double in size and allowed for a trendy walk-around entrance rather than a door. A second shower head, bench seating and built-in niches create a roomy, functional shower. Modern tile, set in a brick formation, lends subtle beauty. And the finishing touch — coordinating pebble tile on the floor. Linen storage was not lost, however. A center cabinet column and set of drawers, mounted on top of the vanity top, allows for ample storage of towels and toiletries. 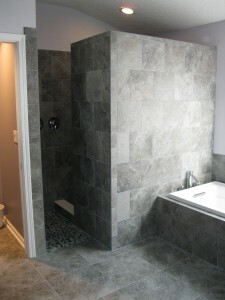 Having seen this design in the master bath of Dreambuilder Four, Karen knew she wanted to recreate this look. High-end fixtures from Kohler and Moen create a streamlined, contemporary look. The Kohler Archer soaking tub sits in the newly built and tiled tub deck and complements the Archer vanity sinks. Stylish Moen Icon faucets crown the new space. Sleek cabinetry with brushed nickel hardware and granite countertops add to the feeling of luxury. New mirrors, light fixtures and paint complete the look. Before and after pictures of the project can be found in Dreambuilder’s Dream Home Gallery. Dreambuilder can help you imagine and create the new kitchen of your dreams. Contact us today to get started! Join our VIP list and receive news and tips about home design. Starr Custom Homes is one of the premier custom home builders in Jacksonville FL. We build luxury homes on your property, in your neighborhood. Discover our communities. The Houzz community and our clients consistently praise Jacksonville custom home builders Starr Custom Homes for design and service. View our awards.